Blooming highlights the importance of human presence and physical connection in our lives. 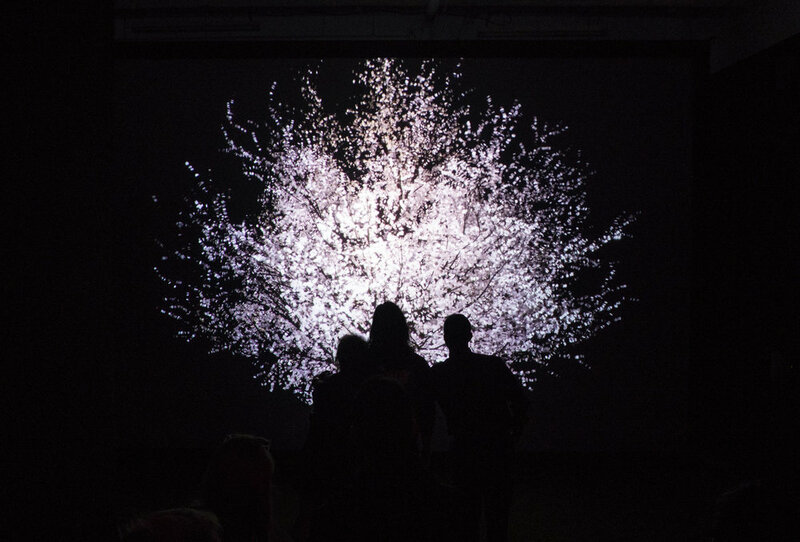 It is an audio-visual interactive installation that responds to physical contact between two to three participants. It takes the form of a life-size 3D cherry blossom tree, a common symbol of social ties and of the transience of life in East Asian culture. As a response to participants’ heart rates, gestures, and skin-to-skin contact as they hold hands or embrace, the tree will flourish in peak bloom and will even release petals. When participants let go, the tree will return to its pre-bloom state. The colors of the cherry blossom flowers change based on participants' heart rates as they interact each other (the faster the heartbeats, the redder the tonality; the slower the heartbeats, the whiter the tonality). In addition to the tree’s visual response, sounds are also modulated according to the tree’s different stages: pre-bloom, blooming, maturing (petals falling). The beauty of the tree in full bloom is an illustration of how physical contact enhances and brightens the human spirit. When a cherry blossom tree flourishes, as it does in Blooming, it is a reminder of human relationships at their peak.